Seems like there may have been mixed feelings from everyone on last night's episode. Well, I thought this episode was absolutely brilliant (big surprise, right?)! While we may not be scouring over the Internet to hunt down any clues, just getting back to the beach and having an old fashion good time with the original castaways just seemed to be a long overdue relief! And sure there was a little bit of plot movement at the end (come on, you didn't seriously think we'd get knee deep into Operation Rescue Jack this week did you? Just enough to keep the story on pace) The producers keep hyping up episode 11 as a BIG episode where we will learn more about the others, so we knew there had to be some uneventful ones leading up to it. And I thoroughly enjoyed myself last night! Even had to stop the TiVo a few times just to get the laughter out of my system! Alright, so let's get into it. It's hard to break this one into storylines because all of the castaways kept interacting with each other. But we'll try! Hurley used to be thin! 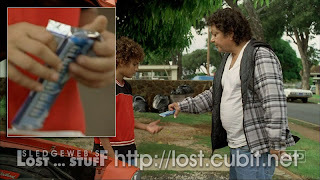 We found out that his father abandoning him for 17 years and giving him a candy bar as a parting gift was what put Hurley into a downward (or upward if you consider his weight) spiral. The Candy Bar is a Glacier Candy bar which kinda ties into the whole Polar Bear mystery happening on the island. Oh yeah and Hurley's Dad is CHEECH! Looks like Hurley's buddy Johnny (skinny guy from Road Trip) ran off with his girlfriend (the one he asked out in the Music Store) after winning the lottery. Just some additional info there. Hurley apparently hired the cooks from Bennigans as his butlers. I thought this was fantastic! The Golden Jesus for Mom was a nice touch. Mom having "needs" was a bit too MUCH! But funny regardless! And speaking of that Chicken Shack blowing up. That was pretty crazy eh? We had heard about this in season 1's Hurley Flashback episode when we were finding out all of the bad luck he has been encountering. Now, we got to see it. And we got to hear him mix up Meteors and Asteroids again. But this just reinforces that there is CLEARLY some bad luck or a higher power that Hurley is encountering. Will we ever found out HOW this bad stuff is happening? Who knows? But it definitely adds to the mystery of the show! The bit with the psychic was hysterical. I'll admit, I kinda saw where it was going but having Hurley name the right price and the psychic caving was fantastic. And the overall theme of the flashback was to "Make your Own Luck" which inspires Hurley back on the island to try and "finally win one"
Okay, I can't even save the best for last. The nicknames? They were a wonderful thing. Jin - "Someone here is hooked on Phonics!" Hurley Retaliates to Sawyer with "Red....neck......MAN" followed by a fantastic drunken "touché " by Mr. Ford. Teaching Jin English all episode was a fantastic subplot. And bets are on to who will learn English faster. Jin or Hiro (from Heroes)! Speaking of teaching Jin English, 3 things a woman needs to hear? "I'm sorry" "You are right" "No, those pants don't look fat on you" Thanks Sawyer! Hurley, please define CRAFTY for Jin? "Crafty is like....when you're good at Crafts!" Anyone else craving some old Dharma Beer? Everyone except maybe Hurley who suggested it had been there since before Rocky III or maybe even II! Oh, I could keep going, it was great! All of the comedy around Roger the skeleton was just fantastic (i think i've used that word one too many times now!). Hurley being so nonchalant about it, Sawyer getting scared by the detached skull. Really, we needed this episode to feel good about LOST again! Hurley slapping some sense (literally) into Charlie was a good time. And it got Charlie out of his "I'm going to die" funk. Was Hurley's logic correct though that if they defied death in the VAN PLUNGE that death is not out to get Charlie? And what did Desmond mean when he said "That's not how it works" in reference to telling Charlie when he's going to die? I guess he has to wait to get one of his crazy flashes of the future. Not sure if this was intentional but when Hurley and Charlie were sliding down the hill in the Van they were heading straight to some BLACK ROCKS. So the song playing in Hurley's flashback and also when the 8-track player started working in the Van was Three Dog Night's "Shambala" Now, I have too much of a life (debatable!) to look into what this song is about and if there are any ties to the meaning behind all of LOST. But if you really want to find out more about it...you can go to this wikipedia link right here. Anyone remember why there was just a dart lying out in the jungle? Is anyone really intrigued to find out WHY it was there if we didn't already know about it? Yeah...I didn't think so! The reunion of Kate and Sawyer with the castaways was a touching moment, wasn't it? Kinda got the sense that everything would be going back to "normal" on the island. Except with Sawyer hugging everyone? That was kinda a bit strange. But at least it was soon followed by normal SAWYER...not "Tortured by the others" Sawyer. I loved that the characters finally got each other up to speed (The braintrust of Locke, Sayid and Kate). Sometimes we're just meant to assume this happens. But I thought it served as a good reminder to even the audience of what was going on. A la...Michael and Walt have left the island (meaning we'll hear from them again eventually! ), Eko's Death, Othersville, Karl. Was anyone else intrigued by Locke's fascination at the possibility that the others can get off the island? He is the one person that doesn't want to leave the island! Some people may see all of these details as space fillers and pointless, but I thought these "Catch Up" scenes were essential. And that leads to our big PLOT movement at the end. I'm confused to if Sayid was sarcastically commenting on Locke's "Compass Bearing of NORTH" and the explanation that the way the sun reflected off of Eko's Stick gave him the bearing. 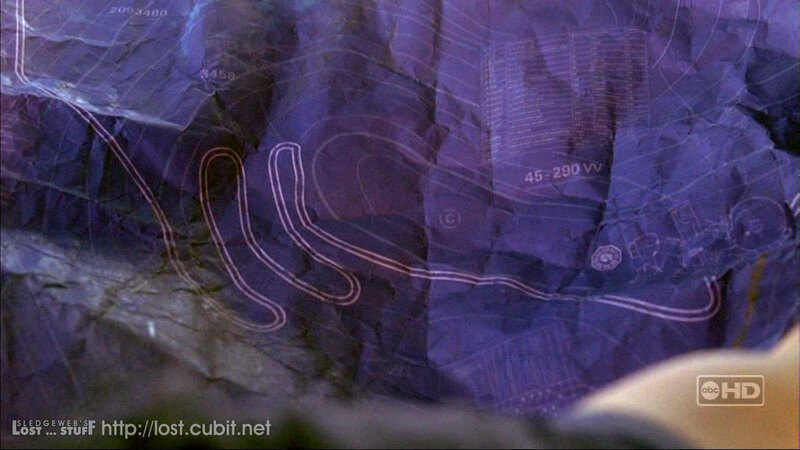 But apparently this all led to the explanation of why they haven't gone to look for Kate, Jack and Sawyer. I think we could've guessed that Kate would turn to Rousseau at the end of this episode once she said she was going to recruit help (if not Locke and Sayid, then who else could really help her?). Finally, someone remembers that Alex is the name of Rousseau's daughter and they TOLD her! Now, we may get to see whose side Danielle is on and if she DID know Ben before firing an arrow into his chest. But for now, the wheels are in motion to rescue Jack and Alex! And that's that. As stated, I thought this episode was a much needed hour of comic relief with enough plot movement at the end to not make the episode totally pointless. As we should know by now, LOST moves at a slower pace than other shows to develop characters. If you are too frustrated with the snail's pace, then maybe waiting for DVD is the route for you! For me? I think 7 days between episodes is a short enough wait time now! So next week is the big OTHERS episode. We get to meet Eye-Patch Man, maybe learn a little (or a lot) about the others and their connection to DHARMA. And of course we're going to start trying to rescue Jack! This is straight from the producers and not ABC, so I'm sure we can hold some weight in the words. But keep your expectations LOW because you'll only end up disappointed if you don't! Hope you enjoyed the blog. Thanks to the NEW commenters for sharing your thoughts last week. Please keep it up. One day, my dream is that people will actually converse back and forth about the show in the comments! Ahhh and what a hopeless dream it is! Did I miss any of the good comedy from last night? Please share and see you next week! Since Sawyer and Kate weren't around when the Hatch blew, then is the dart from the dart board meant to let them know that things have changed while they were away? ahhh good point! That's probably what it was. Totally didn't think about that. I agree Mike, it was the much needed comic relief episode before the 'Big' one next week with the Others and, simply to get back to the island and not see Jack shouting at someone this week was excellent! "All of the comedy around Roger the skeleton was just fantastic." lol...thanks for pointing that out David. Well if anyone was one of the first 40 people to read the blog today, you may have caught some unnecessary EXTRA notes in the blog too where I mentioned obscene magazines and SCOOBY DOOOOOOOOO. Kinda embarassed that was sitting out in the blog for so long. I'll fix "ROBERT" now! And didn't know that Joy...thanks for the tidbit! Another good write-up Mike! Good episode - really enjoyed it. LOVED the Sawyer, Jin, Charlie and Hurley scenes! I don't know what you mean about Hurley's Dad though? I saw the dart in sawyer's foot as an ode to the children's book about the mouse who takes the thorn out of the lion's paw. If you notice, Sawyer's mood did change toward Kate after she took the dart/thorn out. Very nice observation with the DART. Never would've thought of that either! Mike how about a link to CPTV on here?!?! Loving the blog and now the Lost Family is all in sync an we are poised to watch the next episode together. My question was this: why have they not come across the VW van before? Are they exploring new parts of the island? Or did Hurley find this as he was coming back from the dock? I thought he was back already. Hmm. The Scooby Doo reference is great! I was also hoping they'd find something (other than beer) in the van that would give us more info (well, I guess there was the map) but there seemed to be a lot of junk in there -wonder what else might be of interest. Anyway, looking forward to finding out about eye patch man - and seeing OthersVille again. okay, my daughter pointed out that Hurley was chasing Vincent who had the arm of Robert "workman" so it was Vincent that found the VW and was returning there. So, it was a place I guess our crew never went to before. All I'll say is...this episode seemed so random when watching it .....even though I enjoyed every minute of it. Great Comedy. But, they pull what was learned in this ep into future episodes in a couple great ways! Hi Mike... I'm a recent addition to the Lost family, watching on Amazon Instant Video and I always come here right when I'm done with an episode! Thanks for a great blog that translates years later just as well! As far as the dart... Wasn't there a dart board in the hatch? Maybe I'm crazy but I remember something of the sort there, and I just assumed it was scattered there from the hatch implosion. May be totally off. But still, I love it and I love this blog.. So thanks! Feel free to keep me posted as you go through and I'll comment on what I can and try not to spoil :). And the comments start picking up and the end of s3! This was a nice bounceback episode from the last one, but they made it easy on themselves because all they had to do was put Hurley on the screen for 50% of the show! Between Hurley, Sawyer and Charlie you knew this had to be as close to a bottle episode as there ever could be on Lost. I think it had more average laughs per minute than any Lost ep ever. I didn't love everything, including parts of Hurley's own flashback, but anything and everything to do with the van was pure gold. It was such a thrill to see that rust-ravaged saltine-box of van careening down the hill at literally breakneck speed, not knowing - yet knowing - but not knowing, whether it would crash into the rocks, ride through the rocks (this is the island), or steer away from the rocks at the last possible moment. What a triumph! Seeing the boyish joy in those four beard-stubbled, sweat-soaked men riding around in that beautifully hideous van brought a lump to my throat. There was indeed also a good amount of plot movement and set up in the ep, even if they were all baby steps. I really look forward to the inevitable day that Rousseau is reunited with her daughter Alex. And I'll always ship Kate and Sawyer, but I know this is a lost cause. Kate and Jack are destiny, no matter how many ups and downs and third wheels are thrown their way. In the end, Kate and Jack might not have a full-blown committed relationship, but I can't imagine the writers putting Kate and Sawyer together to ride off into the sunset (or hatch, or ocean, or the abyss, or whatever). Plus...some things from this episode end up playing bigger parts in later episodes. But, the Sawyer/Hurley/Jin/Charlie stuff....I could've watched a whole show based on those 4 characters. Roger Workman, Skeletor, teaching Jin English. I have fond memories of this episode! Good analysis on the Kate/Jack/Sawyer triangle. I won't reveal anything! I will say though, Ana Lucia's character was originally written to complicate the Jack/Kate dynamic. But, when characters turned on Ana Lucia, they knew that wasn't going to happen. But, at least Sawyer got some! lol And of course, there is a little vibe between Jack and Juliet going on, but it's tough to know how sincere she is. Hi Mike, Just wanted to say thanks for this blog. I had never watched an episode of Lost before last month (no idea why) and now I'm totally HOOKED. I'm burning through it on Netflix and I always come here after each episode to read your thoughts. Your previous comment about how this episode is the last one where the characters can just hang out together kind of bummed me out because I love episodes like this. This was such a welcome relief from the past few eps. That being said, I am looking forward to getting more answers as the season goes on. Anyway, just wanted you to know that your blog lives on in 2014!! Thanks for the heads up that you're reading these Krista! There have been a few like you who have been catching up on the show later on, and stopping by to read the recaps. I'm glad they're a "gift" that keeps on giving after all of these years! Granted, the whole point of this blog was for an interactive discussion on the details of the show. For people to theorize and discuss where it all may be headed. It led to some very engaging conversations. But, that was part of the experience of LOST. The interactivity of the viewing audience. There were some pretty amazing theories out there. But, in the end, we have to remember the writers had their own vision for the show too! Okay, I'm rambling here. Enjoy the ride! Feel free to comment along the way, and I'll try to respond when I can. You'll see that I did the same for some of the other LOST stragglers. :-) Thanks for commenting! Thanks so much for your response! I do feel like I missed out on a big part of the experience of Lost, since I didn't get to participate in the ongoing interactive nature of the show. That being said, I'm not sure I could have lasted so long between episodes/seasons. It's nice to be able to burn through the episodes and I think a lot of it probably makes more sense when watched quickly in succession. I do love all of the character development. I also love how Lost plays with themes of fate, coincidence, connectivity and chance. How all of us are connected to each other in different ways. Great stuff. I will take your advice and not be too concerned with nitty gritty plot stuff. I trust the team of writers to tell a good story, and won't set myself up with crazy expectations that can never be truly satisfied. I think that's why a lot of people were disappointed with the ending (I've heard a bit about fan reaction to the ending, but I don't know any spoilers of the actual plot). I'm just here for the ride! Thanks again for responding. It's so nice to have a place to come and read about the episodes. I understand the constraints of a show with such a big story to tell. Especially with shorter seasons. I'll just miss moments like the wild bus ride, beer drinking and epic nickname calling (though I'm sure that won't go away). No problem on the response! Tough to pass up a chance to talk LOST one more time. :) The waits were pretty brutal for each episode, and especially those long hiatuses between seasons 3-4, 4-5 and 5-6. It would end in May and not come back until January, sometimes February. But, it made it feel more like an event when it did return! Those themes you touch on are certainly recurring and it is a great part of the show! Good to hear you're in the right mindset to fully appreciate the genius of LOST! Enjoy it! There certainly are more moments between characters like the VAN thing..especially in season 3. But certain characters are always good for coming up with nicknames and say something funny here and there. That part of LOST was never "lost" in the later seasons and it's part of the reason the show was so great in the first place! I loved this episode. It made me laugh so much and provided some relief from all the doom and gloom. Sometimes it's nice to have an episode where there is little plot movement. I couldn't care less how long it takes to move things along. I just love watching every episode. Me too! This is one of the last episodes of the series where it seriously was just a filler episode. And it was the perfect way to do a filler episode. (and actually...it turns out that something from this episode does actually pay off in a later episode, but I don't want to spoil that.) If it wasn't for all the character development in seasons 1-3, season 4-6 wouldn't have worked. LOST is perfect due to how imperfect it was. We had to live with these characters to feel the stakes that continuously increase for them.